I’m writing this on the sunny, warm (50 F+) afternoon of December 21, in between bouts of leaf raking. Hard to believe that just one week ago it was a raw and snowy Saturday. That day, Marian, our friend Kenny, and I headed to Osteria Salina restaurant in Bridgehampton, NY. We were attending “Mega-Tasting 2013”, an afternoon of wine tasting, accompanied by delicious hors d’oeuvres, and excellent conversations with the many wine distributors and East End vineyard representatives. The folks at McNamara Wines Liquors, in conjunction with Osteria Salina and the participating wine reps and East End wineries made this terrific day possible. THANK YOU! Compared to last year’s Mega-Tasting, there was a smaller, more focused crowd of attendees. We drank less wine, enjoyed it more, and had much more interesting conversations. Our four-hour visit flew by, so let me hit some of the high points for you. Yes, our plan was to travel through the tasting venue trying white wines, and then double back for the reds. Guess what… we never even got through all the whites. If we are lucky and the Mega-Tasting team does this again in late-Spring, we will get to those reds, and some roses, I’d wager. We tasted many wines and enjoyed the delicious offerings from the Osteria Salina kitchen. I’ve tried to mention everyone who made our day great, but if I have missed you, let me apologize. Every encounter was appreciated, whether mentioned or not. 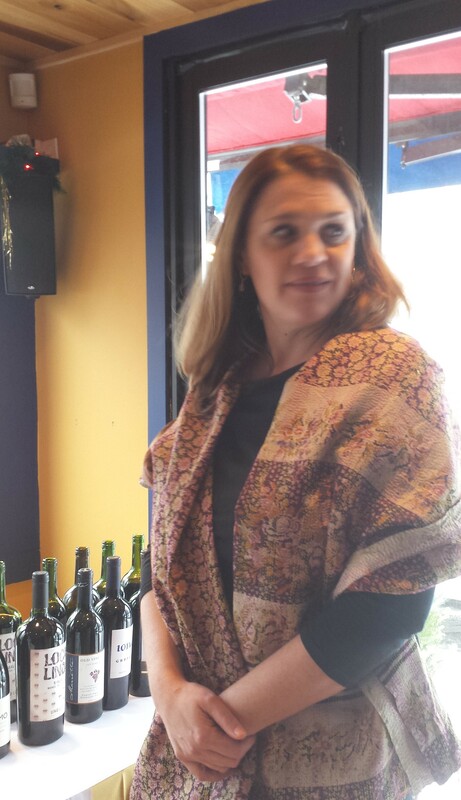 We began our tour with Madison, the wine rep from Lieb Cellars. You can see her and some of the large Lieb portfolio in this photo. We had met Madison earlier, at First and South, during the Taste of the North Fork, and later at Shellabration. At table 17, she offered us a glass of the 2009 Blanc de Blancs sparkling wine. A great way to start our day, this sparkler was crisp, with small bubbles and a bit of yeast on the nose. Right about now, Ceviche “shooters” appeared on the bar and we tossed a few back with the bubbly. Delicious! I might as well tell you that we ended our day of tasting with Madison, and took home a terrific 2011 Lieb Pinot Blanc. It was the perfect accompaniment to a porchetta-style pork roast we had for dinner. Thank you to Madison and Lieb Cellars! 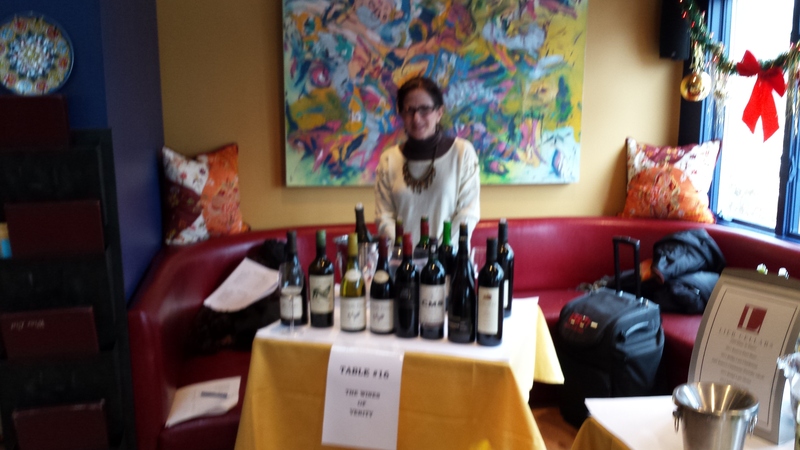 Nearby, occupying tables 19 and 20 were the folks from Martin Scott wines. They offered an impressive array of wines from the old world and the new. We loved the Berriere Muscadet at $12.00 a bottle, and oysters called to us. Guess what we will be enjoying for lunch tomorrow. We’ve written about East End oysters before, here, and here. This Muscadet and oysters are a match made in heaven. What else did we like? The Picollo Gavi di Gavi was popular, and we loved the Errazuriz Sauvignon Blanc, which was grassy with an amazing nose. At $18.00 a bottle, “try it, you’ll like it”. The Osteria Salina kitchen picked up speed, and out came arancini, two kinds of pate, and an excellent cauliflower in a lemon dressing. Oh yes, a pasta in tomato sauce and some roast pork followed quickly. Our team tucked in. I loved the arancini, while Marian and Kenny demolished pate and cauliflower in equal measure. Look out, we were ready for Martin Scott’s New World selection! From the new world, we enjoyed both the Big Vine Chardonnay ($15.00/bottle), rich with butterscotch on the palate, and the Dog Point Sauvignon Blanc ($23.00/bottle), a very focused interpretation of the varietal. Thank you to Martin Scott for delivering some fabulous tastes. We made a quick stop at table 5, where MS Walker Distributors poured C. Alleno Crozes Hermitage Blanc for us. Floral and delicious, it reminded us a bit of an Albarino, but had the richness and body to complement a cream sauce for a “white meal” of veal or pork. This 2011 is an unexpected value at $22.00/bottle. Enjoy it! Like Lieb Cellars and Palmer Vineyards, Bedell is an East End winery, and not a wine distributor. Marian and I remember Bedell years ago, when a collection of big loveable cats ruled the roost. They are late and lamented, but time marches on. At table 6, Matthew Rizzo, Bedell’s wholesale manager, ran things, and gave us a great tasting. Their “First Crush White” at $20.00/bottle was delicious. I found it to be grassy, but Marian and Ken didn’t. We learned that this wine is fermented with lambic yeast. In other words, which ever yeast in the atmosphere finds and ferments this wine is fine. Much like Sherry, the yeast will decide what kind of wine it produces. Think about it. Bedell puts its faith in nature. This time around, Bedell got the best of the deal. 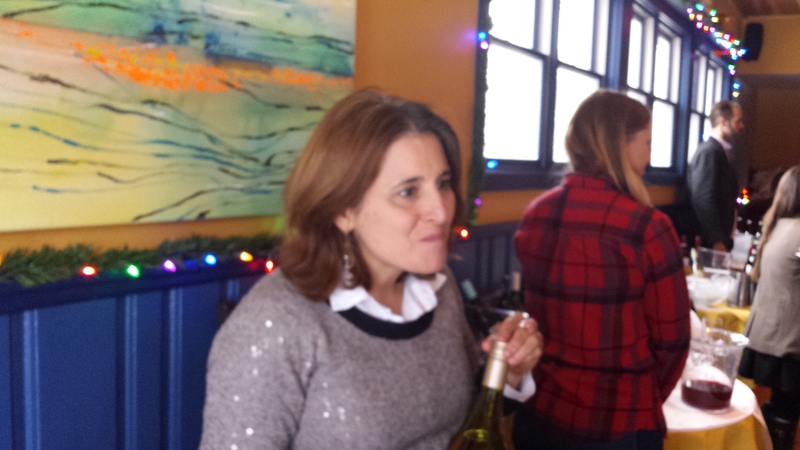 We also tasted their 2012 Chardonnay. We all liked this wine, which starts in oak and finishes in steel. While the reverse of many other vinification processes, it had good effect on this wine, which you can enjoy at $24.00/bottle. Thank you, Bedell! Now warmed to our task, we visited table 7, where Kristin Colombo of Lauber Imports offered us a mix of French and Californian experiences. The Drouhin Saint Veran was spare and well balanced. We all felt they got it right, and would go for this wine at $19.00/bottle. There is a reason why we think of wine when we think of France. 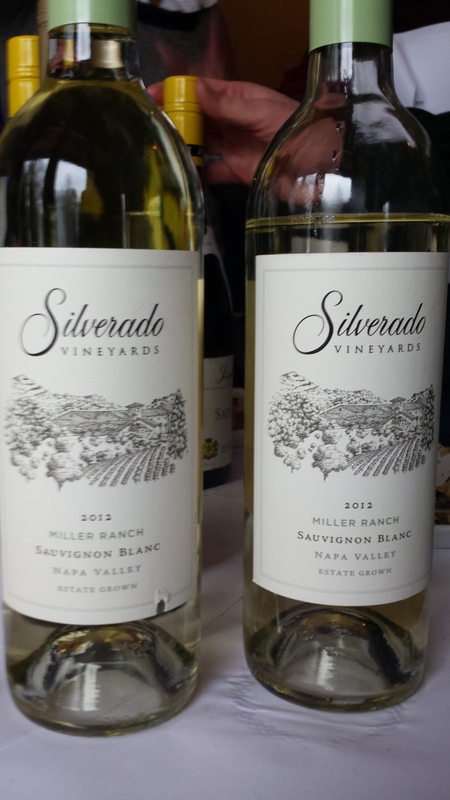 Quite different, but lush and delicious were the Silverado Sauvignon Blanc and Chardonnay from California. What a contrast from the Saint Veran. The Sauvignon Blanc was so rich, I had trouble believing it was what it was. Marian declared it to be a perfect hostess gift, ($23.00/bottle) which would be much appreciated. The Chard was fabulous, benefiting from malolactic fermentation. The oak was well controlled, with a butterscotch note throughout. I loved this wine and thought of lobsters and fish in coconut cream sauce. At $32.00/bottle it is not the everyday dinner pour, but perhaps invites your attention for a special dinner. Thank you, Kristin! Wine distributor Opici offered two interesting and contrasting Chardonnays. The Angeline Chardonnay at $15.00/bottle was well balanced with mild old oak influence. In our opinion, this wine is delicious and available at a great price point. The Martin Ray Chardonnay had a real green melon note on the palate combined with distinctive minerality. We liked it at $22.00/bottle, as a different and interesting interpretation of Chardonnay. Great, Opici! Palmer is an East End vineyard, rather than a distributor. 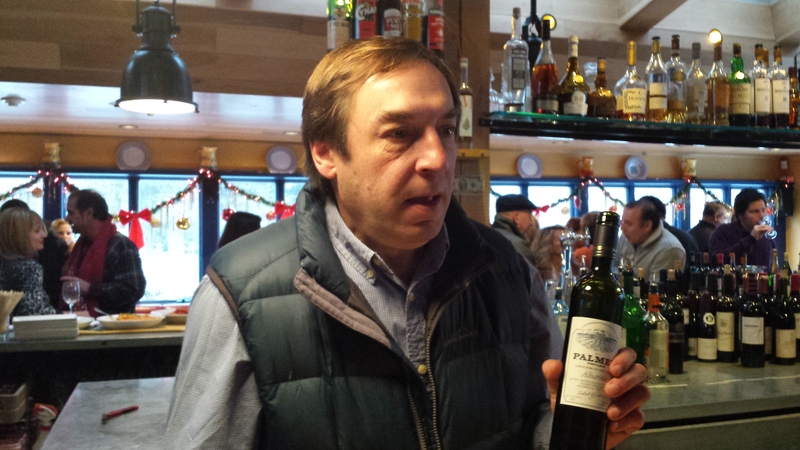 We had the great good fortune to spend time with Miguel Martin, Palmer’s winemaker. Miguel is a Spaniard, and Marian and I had a great time discussing the lifestyle and wines of Spain with him. He is a real gentleman, and makes some fabulous wines. Marian and I have picniced at Palmer, always enjoying their Chardonnay Reserve, and the latest release is delicious we found it lush and well balanced, a beautiful bargain at $17.00/bottle. Wait… we were hungry again! The Osteria Salina team put some fabulous paella and salciccia in reach and we didn’t resist. Miguel produces an Alberino, a favorite varietal of ours that works wonderfully well with shellfish. Both paella and salciccia were perfect companions for these delicious Palmer wines. Great timing, indeed. Visit Palmer and experience Miguel’s excellent work and the friendly atmosphere for yourself. See you soon, Miguel! Paumanok Vineyards is a favorite East End winery, that we have blogged about here. 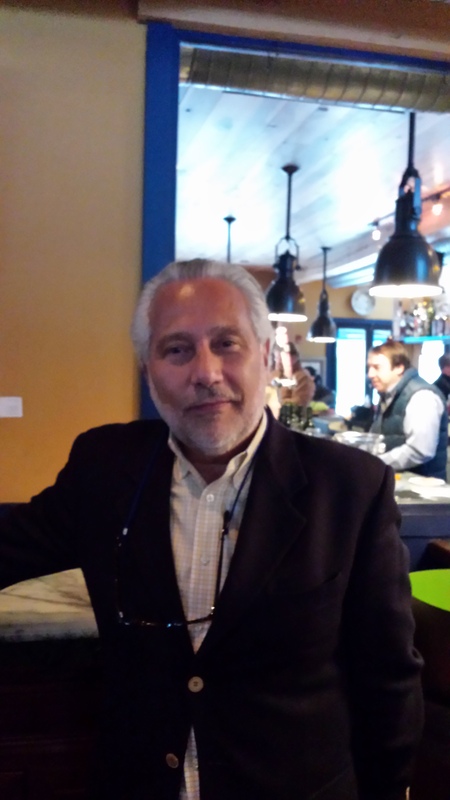 At this tasting event we had the pleasure of meeting Charles Massoud, the Paumanok winemaker. Late in the tasting day, we preferred conversation to imbibing, and reminded Charles of our visit to Paumanok, earlier this year. Expect some excellent production from Paumanok in the upcoming year. Charles, we will be visiting again soon. Verity’s friendly wine rep, who we remembered from last year’s mega-tasting, offered us two fabulous wines. Wolftrap White, from South Africa, is a blend of Viognier, Chenin Blanc, and Grenache Blanc. The blend works and this is a very approachable white that would complement a variety of foods. at $12.00/bottle, this could well be your everyday white pour. You will enjoy it. A more upscale choice is the Fess Parker Chardonnay. This is a delicious wine with great acid. You don’t have to don your raccoon cap to love this wine, but if you have it around, why not? At $32.00/bottle, it is another wine that is not the everyday pour, but not so dear that it can’t be enjoyed regularly. People of my generation remember Fess Parker fondly, in his many pioneer roles. Fess has moved on to a new plane of existence, but his wine remains here, and is lovely! Much appreciated, Verity! At this point, our intrepid band of tasters was pretty much done in. We had to get serious about driving home, and Marian and I had a delicious pork roast in our future. This truly was a mega-tasting of delicious wine and food. Our hats are off to all the offerors who put themselves out for us. Your efforts were not in vain. We will be enjoying your wines and dining at Osteria Salina this winter, and beyond. 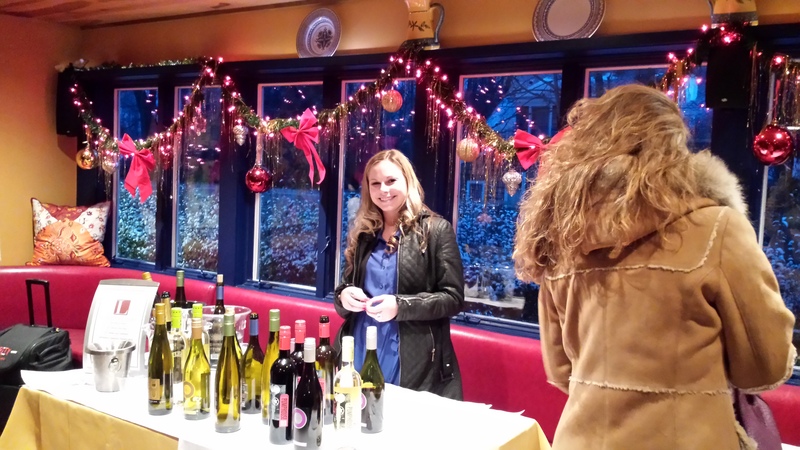 These organizations, along with the participating wine distributors and East End wineries, delivered a wine and food tasting event that surpassed the well-received 2012 blow-out. Having attended both, we agreed this one was even bigger and better. The team from McNamara put the wheels in motion for this year’s mega-event and the results were fabulous. All through 2013, when Marian and I visited their wine shop, we asked whether there would be a tasting to rival the one in 2012. Now I can tell you the 2013 event was bigger and better. It takes enthusiastic leadership to pull something like the mega-tasting together, and these folks pulled out all the stops! Osteria Salina is a Sicilian restaurant located at 95 School St. in Bridgehampton, NY. The Osteria has great food, an inviting interior, and a friendly and accommodating staff. All through the five-hour open-house wine tasting, Osteria Salina offered platters of delicious food, ranging from pastas and salsicce to arancini and ceviche. If you were there, it was your chance to see the Osteria Salina team deliver at peak performance. They did a wonderful job, and their efforts were much appreciated! Wondering where to dine tonight? Head for Osteria Salina! 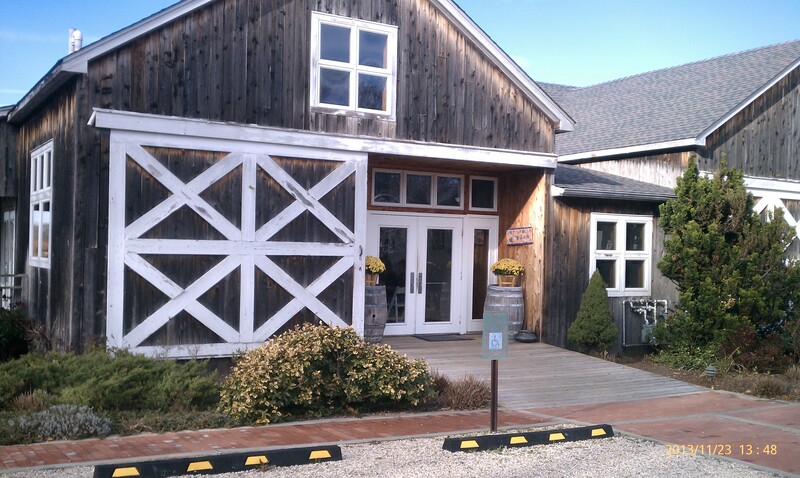 We will be heading out in search of the Quogue Animal Shelter, a raw bar lunch, and a visit to Old Field Winery. Stay tuned, and enjoy your trip around town!